It was once said that the Royal Albert Hall was “the only place a composer could be sure of hearing his piece twice”. The legendary UK music venue’s sound has never quite matched its looks; that iconic domed roof and amphitheater-style design has ensured that any music played in the Hall has always suffered from a terrible echo – which is why a record-breaking speaker system was needed to finally give the Royal Albert Hall a sound quality fit for royalty. Costing over £2 million, the speaker installation took 693 days, and uses 15,291 meters of cable and 465 individual speakers, making it the world’s largest single-room speaker installation. We had the chance to see the new system at a special demo in the famous London Hall, where we were treated to everything from a live string quartet to the chest-thumping bass of Daft Punk. If you’re a music or history buff, there are few experiences more breathtaking than walking into the main arena of London’s Royal Albert Hall; opened in 1871 by Queen Victoria in memory of her husband Prince Albert, it has hosted everyone from Albert Einstein to the Beatles. Even if you aren’t aware of the 148 year-old building’s rich history, the imposing 20,000 ft dome, looming Grand Organ, and intricate, velvet-curtained boxes make it a sight to behold – which is why ensuring the Hall’s survival with the new sound system was so important to those who care for it. Could a new sound system really ensure the survival of the Royal Albert Hall? After all, it will always be a site of historical importance whether it sounds good or not – but to Hassall, neglecting its facilities as a music venue, is tantamount to forgetting why the Hall was originally built: “to promote the arts and sciences”, as per Prince Albert’s vision. “It’s not a museum or a mausoleum, or a monument; we’re a venue” he told us, before we were invited into one of the boxes on the ground floor to listen to a live string quartet reciting popular classical songs. As they played, the sound engineer turned the system on and off so we could hear the difference in audio quality. At this level of the Hall, the change was subtle, but noticeable; rather than coming from the stage, it felt as though the music was coming from all directions, making the experience feel more immersive and intense. Part of that multi-directional sound is thanks to the inclusion of front and rear speakers in all 144 boxes in the venue. Not only is the speaker system big, it’s also meant to be very clever. Created by D&B Audiotechnik, the system was designed especially for the Albert Hall using the latest 3D modeling and simulation techniques – a crucial step considering the acoustic challenges posed by the unique geometry of the Hall. Steve Jones, who works in Education and Application Support at D&B Audiotechnik told us that the team had to be very careful not to disrupt the design of the Hall, so much so that speakers inside the boxes were colored exactly to match the shade of the walls inside. It’s not just about color-matching though; as a Grade I listed building, the team had to be extremely careful when installing the new system so as not to damage the Hall’s unique design. Jones remarked that he was “still astounded” that Historic England (the public body that cares for England's historic places) gave them permission to carry out the work; after all, drilling holes into one of the UK’s most-loved buildings comes with its fair share of risk – what if the team damaged something beyond repair? Those risks appear to have paid off. After spending some time in the box, we ascended another few levels up to the Rausing Circle, and then finally to the standing room-only Gallery – where the echo had been the most noticeable in the past. As Jones says, the Gallery is “the one bit of the Hall that creates the most reverb”. Up there, as the speakers blared out Daft Punk, the difference was most noticeable. There was no echo, only immersive, full-bodied sound, with warm bassy timbres and crisp, detailed vocals. Every ‘opening’ in the Gallery now has its own speaker suspended from the ceiling, pumping music directly to the audience standing below, as well as seven enormous circle delay arrays hanging from the domed ceiling. Jones told us that, as well as reducing echo, the new system also “democratizes” the listening experience, explaining that “audiences can now expect a level of audio quality and consistency across all seats, which [has] never before been achievable”. So, whether you’re stood on the ground floor, high up in the Gallery, or even sitting in the Queen’s box (although you’ll need a title for that last one), every note, lyric, or word you hear should sound clear and precise. Of course, there’s little point in installing a state-of-the-art sound system if artists won’t use it; it’s not at all uncommon for musicians to tour with their own equipment, trusting in what’s been tried and tested. As the string quartet launched into a lively rendition of Mozart’s Eine Kleine Nachtmusik, Ollie Jeffrey, Head of Production and Technical at the Royal Albert Hall, told us that getting the artists, comedians, and orchestras that play at the Hall on board was one of the easiest things they had to do. He said that the take-up has been “incredible”, with “96% of artists between September and December using the new system” – a testament to how well it works, and how much more convenient it is for artists. 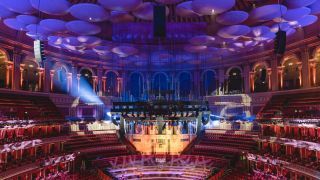 Before the new system was installed, the Royal Albert Hall hadn’t seen a major upgrade since the fixture of the “iconic acoustic mushrooms” to the ceiling in 1969 – also designed to reduce the Hall’s echo issues. Will we be waiting another 50 years for the next audio upgrade? Apparently not, according to Jeffrey, who told us that the system will be worked on and updated regularly. Although he wouldn’t be drawn on specifics, Jeffrey told us that the Royal Albert Hall was ‘continuing to look’ into the latest audio tech, including systems that support “immersive sound”. While he didn’t reveal which kind of immersive sound this could be, immersive sound includes technology like object-based surround sound Dolby Atmos or the cinema sound codec DTS:X. “We are a world-class venue so we should have world-class technology - the journey isn’t over” Jeffrey tell us. Does this mean the new system isn’t quite world class yet? The Royal Albert Hall will likely never achieve the sonic perfection of modern concert halls like Manchester’s Bridgewater Hall or the Philharmonie de Paris – the sound there is something that started at construction, with every angle, beam, and surface calculated with scientific precision to completely deaden sound and eliminate unwanted echo. The Royal Albert Hall, thanks to its unique geometry, will probably never achieve total perfection – but that’s a big part of its charm. And thanks to its new sound system, it’s closer than ever before.